Brexit – What consequences for European Works Councils ? A referendum was held on 23 June 2016, to decide whether the UK should leave or remain in the European Union, the so called Brexit (“British” and “exit”). England and Wales voted for leave. Scotland, Northern Ireland, Greater London and Gibraltar backed staying in the EU. Liverpool, Manchester, Bristol, Cardiff and the regions around the university cities such as Cambridge, Oxford and Warwick backed staying in the EU. Article 50 of the Treaty on European Union establishes the procedures for a member state to withdraw from the EU. It requires the member state to notify the EU of its withdrawal and obliges the EU to then try to negotiate a withdrawal agreement with that state. Britain's “Leave” vote does not represent that formal notification. The High Court in London ruled on 3 November 2016, that only parliament – not the prime minister – can authorise the signing of Article 50. The government appealed against the judgment. The Supreme Court heard the case from 5 to 8 December 2016 and confirmed the High Court ruling on 24 January 2017. On 13 March 2017 both Houses of Parliament endorsed the activation of Article 50. The prime minister started the formal legal process of withdrawing from the EU on 29 March 2017 and negotiations started on 19 June 2017. Meanwhile politicians in Scotland, Northern Ireland and Wales called for a referendum on leaving the UK (see press report). EU law still stands in the UK until it ceases being a member. After that date, the British government is free to repeal - or not - the law transposing the EWC Directive. Currently there are no legal changes regarding the status quo of European works councils, SE works councils and special negotiating bodies. Theresa May called a snap election to strengthen her parliamentary majority and have more power and freedom to negotiate Britain's exit from the European Union, but she lost her parliamentary majority. The increase in Labour’s vote share was the largest for any party between two general elections since 1945. Theresa May is now vulnerable to unforeseen events. The government lost a crucial vote in the House of Commons on 13 December 2017 due to critics within the conservative party who sided with the opposition to back an amendment for a right of veto over the final Brexit deal (see press report). Now the government must go through a legislative procedure on the withdrawal agreement. There is however no majority in Parliament for a particular form of Brexit. The Labour Party will not support a Brexit deal unless it meets the party's “six tests”. Any deal must include a strong relationship with the EU and the same benefits the UK currently has from the single market (see BBC report). 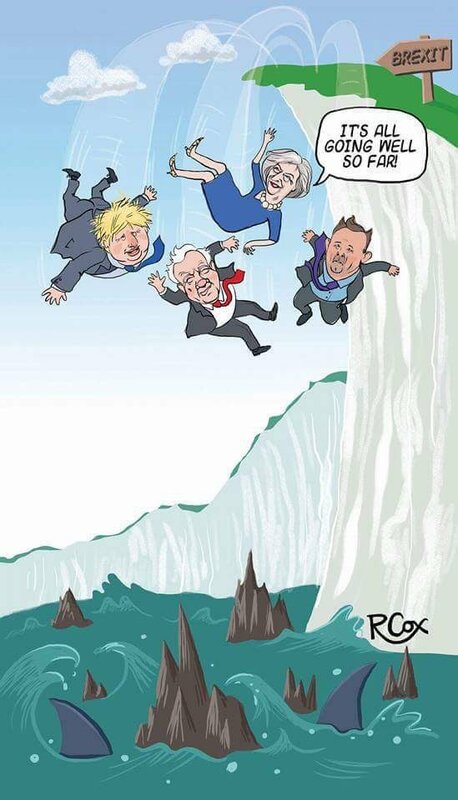 Without approval from Parliament the Brexit would either be postponed, completely called off or otherwise - economically speaking - threaten a “fall off the cliff edge”. The historic vote took place on 15 January 2019 and the agreement proposed by the UK government was rejected by a large majority. “If there is no House of Commons support for no deal, then you are very close to new elections”, said Former European council President Herman Van Rompuy. “If you have new elections, then article 50 [the legal process for Britain's EU exit] will have to be postponed” (see press report, 25 August 2018). On 10 December 2018, the European Court of Justice has ruled the UK can cancel Brexit without the permission of the other 27 EU members (see BBC report). On 17 January 2019, cabinet ministers agreed to examine a possible timetable for a second vote on Brexit (see press report). A quarter of voters say they would consider voting for the Independent Group of MPs who broke away from their parties in late February 2019 (see press report). An emergency bill to instruct Theresa May to seek an extension to article 50 and avoid a no-deal Brexit has been adopted on 3 April 2019 (see press report). How to avoid the “cliff edge”? Brexit cliff edge: What happens immediately? There will be transitional arrangements necessary for the period between the UK leaving the EU and any EU-UK trade deal being finalised and ratified. During this period the country is no longer a EU Member State, but must however abide by EU laws and contribute to EU's budget. On 22 August 2017 the country's biggest airports warned of a 41% fall in passenger demand and the risk of a 20.6% decline in aircraft movements (297,000 flights), in the absence of an aviation agreement between the UK and EU (see press report). On 15 September 2017 the head of the UK tax agency said Britain could need up to 5,000 extra staff to handle customs and border checks after Brexit. This could cost as much as £800m and take seven years to implement (see BBC report). On 19 September 2017 the chief executive warned that disruption of flights could be catastrophic, with 140 passenger flights and 43 cargo flights a day between the US and Britain (see press report). Unless a transition deal is signed, from September 2018 Ryanair will sell tickets including the warning: “This flight is subject to the regulatory environment allowing the flight to take place.” (see press report). The majority of the committee requested an extension to the Article 50 process beyond March 2019, according to a report published on 18 March 2018 (see press report). Transport between the EU and the UK will be “severely impacted” with roads and ports blocked by customs queues and millions of British and EU citizens would be left in legal limbo if the UK leaves without a deal, the European Commission said on 19 July 2018 (see press release). Pharmaceutical companies have been told to stockpile medicine and businesses should start planning for new customs checks, new software or logistical help (see BBC report, 23 August 2018). Eurostar trains could be stopped on reaching French territory, and planes from Britain prevented from entering French airspace in the event of a chaotic no-deal Brexit (see press report, 13 September 2018). A no-deal Brexit could require UK government bailouts like those following the financial crisis to prevent businesses from going bankrupt (see press report, 11 November 2018). The Bank of England warns the UK economy could shrink by 8% and house prices could fall by almost a third. The pound could fall by a quarter (see BBC report, 28 November 2018). A new report to the Kent county council warned of major disruption (see press report, 6 December 2018). In case of a no-deal, the military will help to keep public order and to deliver medicines to hospitals (see press report, 18 December 2018). The UK government has spent more than £100m to charter ferries to ease “severe congestion” at Dover (see BBC report, 29 December 2018). Shops should hire extra security guards, because shortages may lead to panic-buying (see press report, 10 January 2019). A secret UK government document reveals chaotic planning for no-deal Brexit (see press report, 22 March 2019). What are the scenarios after EU withdrawal? After the transition period there are several paths onwards: the Norwegian-option, the Swiss-option and a so-called “Hard Brexit”. In Norway there was no majority for accession to the EU in the 1972 and 1994 referendums. Norway as well as Iceland and Liechtenstein are however, fully integrated into the single market as a consequence of the European Economic Area agreement. In practice, this means that Norway transposes almost all EU laws into its national legislation, but has hardly any influence on the legislation. The EWC Directive therefore also applies to Norway without restriction. If the UK joins the European Economic Area, British EWC law has to remain in place. In Switzerland, the accession to the European Economic Area was rejected by referendum in 1992. However, in order to benefit from the advantages of the common market, comprehensive bilateral agreements between Switzerland and the EU were concluded in 1999 and 2004. By these means, important parts of the EU legislation have been adopted in the Swiss national legislation. In order to prevent Switzerland from “cherry picking”, all these agreements are inter-connected to one another through a “guillotine clause”; if a tiny part of an agreement is canceled, all agreements are automatically terminated. In December 2008 Switzerland adhered to the Schengen Agreement and abolished border controls with the EU (see report in EWC News 3/2008). The EWC Directive however does not apply, since there was no majority on it in Parliament, in June 2012 (see report in EWC News 2/2012). If the UK concludes bilateral agreements like Switzerland, British EWC law can be removed. Do British EWC members lose their mandates after EU withdrawal? Prior to 15 December 1999 there was no EWC legislation in the United Kingdom. Nevertheless, at that time many large British companies had established a EWC. The EWC agreement was then, for example under Belgian, German or French jurisdiction. Usually the UK workforce was also integrated into the European works council. In companies with headquarters in Switzerland, the Swiss workforce is represented on the EWC in over 70% of the cases. This suggests that in practice, a massive loss of British mandates will probably not happen. The situation is different in EWC agreements under British jurisdiction. It remains entirely uncertain, as to whether or not they will continue to apply or have to be completely renegotiated. At the conservative party convention held in Birmingham, government members declared on 2 October 2016, that the currently applicable labour legislation would not be touched. If this promise is kept, then current British EWC legislation (TICER 2010) would also remain unchanged. because the EU buys 44% of the UK's exports and provides 54% of its imports. Former foreign secretary and new Chancellor Philip Hammond says it is crucial UK retains full access to the single market. Government of Wales: it is important to retain access to the European single market. But German Chancellor Angela Merkel says, access to the single market will have its price. It is not possible to demand use of “club facilities” without paying membership dues. EU leaders are refusing a “Europe à la carte” by letting Britain select parts that it may like, such as access to the single market, while dispensing with EU principles such as free movement of people. And Norway may block UK return to European Free Trade Association (see press report). The American Chamber of Commerce to the EU warns of dangers. Many US companies are based in the UK because of its role as “a gateway to the single market” (see press report). On 12 June 2017, the engineering industry organisation (EEF) called for access to the single market to be at the heart of Brexit negotiations (see BBC report). On 22 June 2017, London Mayor Sadiq Khan from the Labour Party called for the UK to remain in the single market (see press report). Up to 70,000 jobs could be lost in London's financial sector if the UK crashes out of single market (see press report). Post-Brexit customs checks will lead to border chaos and cost at least 1.1 billion € per year (see press report). On 12 September 2017, Labour leader Jeremy Corbyn told the TUC conference his vision of a “jobs-first Brexit” that guarantees full access to the European single market (see press report). The TUC has developed five tests assessing the options for Brexit. On 30 November 2017, the organization called on the government to seek membership of the single market (see report). The Scottish government has published its study into the impact of Brexit on 12 January 2018. Its preferred scenario is to stay in the EU (see press report). A report published by the European Business Aviation Association on 29 January 2018 stated that “maintaining the status quo” is the only Brexit model that would avoid disruption (see report). The pound hits its lowest level since 1985. In early July 2016, several commercial property funds have been forced to suspend redemptions. They have to raise cash and need to sell properties. Over half of this sector is now on ice. The pressure on the pound is stoking inflation, denting household finances and putting a brake on spending. The first quarter of 2017 saw the biggest decline in retail sales since the financial crisis (Press report, 21 April 2017). Shoppers would face “higher prices, less choice and poorer quality” (BBC report, 10 July 2017). 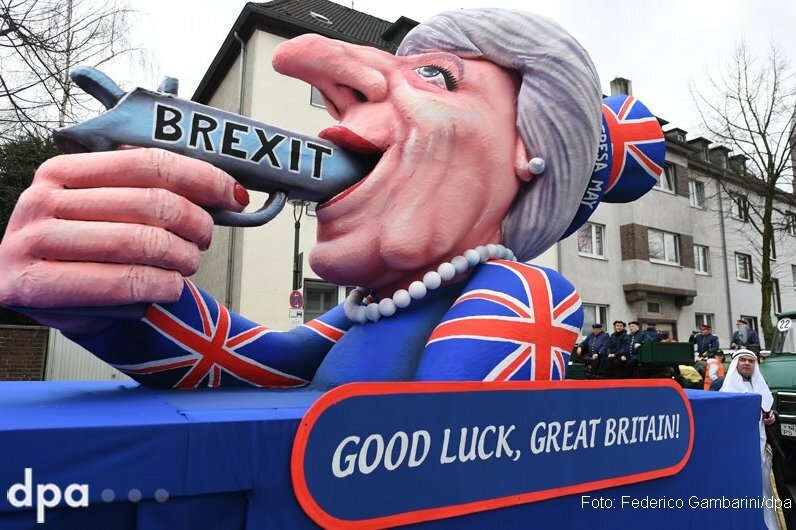 UK policymakers face a dilemma between countering rising inflation (up from 0.4 to 2.9 percent since the referendum) and falling growth, making the UK the worst performer in the European Union and bottom of the league among the world’s advanced economies (Press report, 15 June 2017). The vote to leave the European Union has cost each UK household already 900 £ (Press report, 22 May 2018) and impact analysis, undertaken by the government, found that economic growth would suffer under any of the existing models for a future relationship with the EU (Press report, 8 March 2018). Brexit is costing the public purse £500m a week and the economy is 2.5% smaller than it would have been had Remain won the referendum (Press report, 29 September 2018). Ratings agency Moody's announced on 2 November 2016 to downgrade the UK's sovereign rating if the UK lost access to the Single Market (see announcement). According to the Institute for Fiscal Studies, Britain is set for a return to falling real pay later this year, with this decade now set to be the worst for pay growth since the Napoleonic wars. The Bank of England warned that around 10,000 jobs in the UK are at risk on “day one” of Brexit and 75,000 financial roles could be lost if no trade deal was struck with the European Union. The University of Oxford finds that the UK's car industry has lost 9% of its volume due to Brexit, and overall investment has dropped by 80% over the last three years (see report, 10 April 2019). Scotland voted to remain in the European Union. The Scottish Government started discussions with the EU institutions and other member states about Scotland remaining in the EU. Since early August 2016 there is a call for a referendum whether the country should continue as a monarchy or republic. On 30 March 2017 Scotland's first minister formally asked for powers to hold a second Scottish independence referendum (see BBC report). It could take place at the end of the Brexit process. The Labour Party published a plan for a federal UK, a “third option” for Scotland's future. The Scottish government should be given the power to set VAT rates and sign international treaties (see BBC report). This challenge has dramatically increased the complexities and uncertainties of Brexit negotiations. The announcement effectively starts a two-year independence campaign. In an already disadvantageous negotiating position, Theresa May is now open to having the Scottish issue used as leverage against her throughout the process (see political analysis). Former Prime Minister Tony Blair said in January 2016, that he thinks Scotland will leave the United Kingdom if the United Kingdom leaves the European Union (see BBC report). The U.S. bank JP Morgan said on 29 June 2016 it now expects Scotland to vote for independence and introduce its own currency before Britain leaves the European Union in 2019 (see press report). Scotland is looking to open its own trade representations abroad and signed its first economic collaboration declaration with Bavaria on 24 March 2017 (see press report). A senior German conservative MEP says: “Scotland is a member of the European Union and fulfils all of the conditions. There will be not many technical problems”. And Spain's foreign minister confirmed his government would not veto any attempt from Scotland to join the EU after Brexit (see BBC report). An independence referendum is under discussion on Irish reunification in order to maintain Northern Ireland's EU membership. At least, Northern Ireland would ask for special arrangements with the EU. The exit from the EU could undermine the peace agreement signed in 1998 (see press report). The 2 March 2017 poll brought an end to the unionist majority in the Northern Ireland Assembly. The two main nationalist parties now have more seats than the two main unionist parties (see press report). Population change will bring a majority for Irish unity in a few years' time anyway (see political analysis). If the island reunifies, the north will automatically regain EU membership (see press report). So the EU has done something it has never done before: it has offered an incentive to part of an existing state to join another state. London voted to remain in the EU. A petition calling to declare London independent from the UK has received more than 180,000 signatures so far. Supporters of London's independence argued that London's demographic, culture and values are different from the rest of England, and that it should become a city state similar to Singapore, while remaining an EU member state (see press report). On 2 July 2016 demonstrations for the independence of Wales and to remain in the EU took place for the first time in two cities. On 18 March 2017, the first minister of Wales warned of a “trade war” between the nations of the United Kingdom after Brexit (see BBC report). Gibraltar voted with 96% majority to remain in the EU. Spain is calling for joint sovereignty in order to maintain Gibraltar’s EU membership (see press report). Gibraltar's Chief Minister seeks a special Brexit deal to preserve freedom of movement (see press report). A former Labour cabinet minister called on the government to think about “co-sovereignty” (see press report). Brexit could have “catastrophic” implications for the future and the sovereignty of the Falkland Islands. Argentina is watching developments closely (see press report). On 28 March 2017, Former British prime minister Gordon Brown called for the creation of councils for England’s regions (see press report). Andy Burnham, the first elected mayor of Greater Manchester, is seeking the establishment of a new body: the Council of the North (see press report). Former Labour Prime Minister Tony Blair said: “We have done something rather bizarre with Brexit. It's like moving house without having seen the new house. 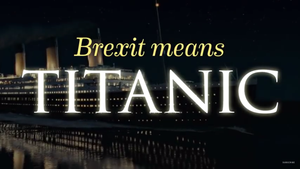 The vote to leave had been a reaction against austerity, globalisation and immigration.” (see BBC report). According to Malta’s Prime Minister, who will chair the EU’s rotating presidency in early 2017, Britain must be ready to accept an “inferior deal” (see press report). After Tony Blair (Labour Party), the former Prime Minister John Major (Tories) said, a second Brexit referendum would be “perfectly credible” (see press report). A poll from 14 to 17 March 2017 shows 54% of Britons (63% of Scots) believe the Brexit vote increases the chances of the United Kingdom breaking apart (see press report). British consumers are bracing themselves for an expensive and uncertain post-Brexit future, a new survey has revealed (see press report). This would include the rights to live, work, study and travel in the EU – and many would be prepared to pay large sums to do so (see press report). Living standards are falling, inflation rising and growth and productivity slowing, top Scots warned in open letter (see press report). England has yet to answer fundamental questions raised by Brexit, former Irish Prime Minister John Bruton said. Brexit is intimately linked to deeper questions of identity, who they are and their place in the world. And that's a psychological process rather than an economic one (see press report). According to a new poll, 76% said they felt Brexit negotiations are going either “quite badly” or “very badly” (see press report). An election analyst said it was “the first time any pollster has recorded backing” for a second Brexit referendum (see press report). The British public has swung behind staying in the EU by its largest margin since the referendum (see press report). The poll also found that 74% are dissatisfied with Theresa May's leadership and more than half of respondents think Brexit will hurt the UK economy (see press report). The proportion of people wishing to stay in the EU reached the highest level since the 2016 Brexit referendum (see press report). Boris Johnson, UK Foreign Secretary: I don’t want free movement of people but I want the single market. Carlo Calenda, Italian economics minister: No way. Johnson: You’ll sell less prosecco. Calenda: OK, you’ll sell less fish and chips, but I’ll sell less prosecco to one country and you’ll sell less to 27 countries. Question to the children: which politician has always skived off math lessons? On 17 January 2017 Theresa May published her plan for Brexit. It's all going well so far!